In Britain we are lucky to have a rich and varied architectural history, which defines the character of our landscape. Of the millions of old buildings, around 500,000 are listed for their ‘special architectural or historical significance’, and the team at Period Living have had the privilege of visiting some exquisite listed homes. Take a tour of these gorgeous listed homes – and find out more about listed buildings in our essential guide. Officially introduced in 1947, the listed buildings scheme is not only designed to highlight these special properties, but also to protect their integrity and unique character by monitoring any changes made to them. In England and Wales, listed buildings are given one of three grades: Grade II denotes structures of ‘special interest’ (92 per cent); Grade II* ‘more than special interest’ (5.5 per cent); and Grade I ‘exceptional interest’ (2.5 per cent). In Scotland, the categories are A, B and C, while in Northern Ireland they’re A, B+, B1 and B2. Although owning a listed property is a great honour, it also comes with great responsibility and many owners of listed homes see themselves not as property owners but as custodians of heritage. In order to preserve their unique character, there are limitations to what you can do to a listed property and you may need to apply for listed building consent if considering making changes. The Grade II-listed former flour mill is set in two acres of grounds, with the millpond a bonus for the fishermen in the family. The mill was built in 1862 but had fallen into disuse by the 1920s, becoming completely derelict before being restored into two weekend homes in the 1960s. Carefully restored by the current owners, it still boasts its working mill wheel. Take a look at the renovations the Jones made to this carefully renovated Victorian watermill, transforming into an idyllic family home. Read more about how to renovate a Victorian house in our expert guide. Tucked away on the edge of a pretty village, just a couple of miles away from the wood that inspired AA Milne’s Pooh Corner, Mary Gwynn’s historic East Sussex home has been through a huge five-year programme of renovations. Possibly built as long ago as 1450, this Grade II-listed property is a timber-framed Weald hall house. It overlooks a large front garden, with a door from the living room to a seating area. See more inspiring gardens and learn how to design your own with our 28 traditional garden design ideas. This Grade II-listed townhouse in Marlborough, Wiltshire, was built in the 1580s or 1590s and is awash with period features. Take a look at how Jane Way transformed into a cosy home brimming with character. This Grade II-listed home was built in the 1640s, near Burford in the Cotswolds. Many of the house’s original features were still intact, when Simon Fenwick bought the property. Read more about his renovation of this Cotswold home then find out more about renovation costs for your project in our expert guide. Having bought their 16th-century grade II-listed cob longhouse 20 years ago, Suzi and Chris Carman have taken their time to create an inviting country cottage. For centuries, cob has been used to build homes throughout the UK, especially in the south-west of England and Wales and it makes for a unique and characterful property. Find out how to repair and maintain old roofs, including thatch, in our guide. Built as a hunting lodge in 1642, this Grade II listed Jacobean hunting lodge has a history of wealthy and notable names that had previously occupied the house throughout its history. Yet in more recent times the house had fallen into disrepair. Discover how Tim and Sarah Hopkins transformed it into the home of their dreams. Amy and Philip fell for the characterful, rambling a Grade II-listed Georgian house immediately. It had a beautiful village setting, its façade was framed by climbing roses and box trees, and the interior was full of original features. The Hana Reynolds rule of house-buying is simple. ‘I only buy pretty homes,’ she says. ‘The first time I saw this cottage was from the car and I knew it was going to be the house we ended up living in. I still get that feeling when I walk up the path now.’ A two-bedroom, semi-detached Grade II-listed weaver’s cottage in Somerset, built in around 1750 from Hamstone. There was already something special about this Cotswold manor house, but when Rosie Pearson moved in she was determined to add to its magic. Asthall Manor in the Cotswolds is the glorious setting for On Form, a biennial stone sculpture exhibition. Rosie added a front drive, relocated a staircase, added a new bathroom and extended the kitchen. The garden has been landscaped. The house in Oxfordshire's Windrush valley was built in the early 1600s and was the 1920s home of the Mitfords. Grade II*-listed, this cottage dates back to the 12th-century and is one of the oldest still standing in Kent. A Grade II-listed 12-bedroom stately home near Inverurie, in rural Aberdeenshire, originally built in 1170, Wardhill Castle has been in Will Leslie’s family for 850 years, although its magnificent baronial exterior bears little resemblance to the modest house that was first built on the site by William Cruickshank, in the 12th century. The property was vastly extended over the ensuing centuries and became grander in scale until its height in Victorian times, after which the building fell into disrepair. The task the couple were faced with was daunting to say the least, read on to discover how they transformed this baronial castle into a family home. The six-bedroom house in the South Hams area of Devon is set in two acres of land. It is Grade II listed, with older sections dating back to 1602. Other parts were added in the 18th and 19th centuries. The property was in good condition, but the Gavins still wanted to make their mark on it straightaway – take a look at the products of their renovation project. Anna Vines and Graham Booth took on a bigger task than they budgeted for when they renovated their historic home, designed by ‘God’s own architect’, Augustus Pugin. 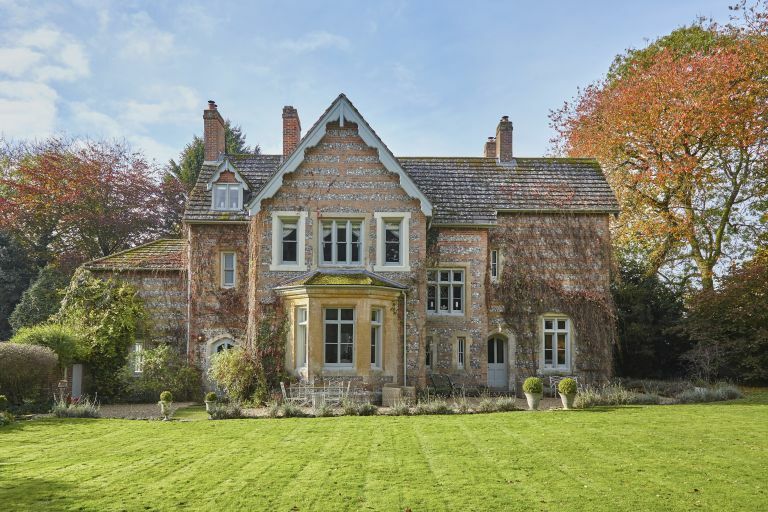 The hall was a mid-19th century country house in Rampisham, West Dorset and required serious repairs including repairing original lime plaster, rebuilding chimneys and gable ends, refurbishing of the windows and the addition of solar panels and a woodchip boiler added. Be inspired by the painstaking restoration of Pugin Hall. Find out more about refurbishing of the windows in our guide. Louisa and her husband Charlie took on the renovation of a Grade II-listed five-bedroom cottage in north-east Oxfordshire. The house dates back to 1806, with the living room and master bedroom above added in 1902. Built in Cotswold stone, with early-19th-century origins, it had high ceilings, big windows and plenty of period features, as well as, most importantly, a welcoming, peaceful character. However, there was lots of work to do - the first big job was replacing the floor-to-ceiling windows. Take a look around the finished home renovation then learn more about choosing windows for period homes in our guide. This Grade-II-listed Queen Anne house was built in the early 1700s, near Oakham, Leicestershire. The house has seven bedrooms and four bathrooms, with extensive gardens and 12 acres of land. Sallyanne and her partner Andrew moved into the Queen Anne property six years ago, entranced by its elegant proportions and, more practically, the layout of the rooms. The Grade II* listed manor house, which dates back to the 16th century, is surrounded by a moat and 400 acres of arable farmland gardens. Part of the Thornham Estate, it had been tenanted continuously from the early 18th century until 1948, and when it came into the ownership of Caroline Spurrier, needed a lot of work doing. Tina and Martin’s 15th Century Grade II-listed stone cottage has an idyllic setting in a village close to the borders of the Somerset levels. They fell in love with the charming little bridge over the rhyne which surrounds most of house.